For much of American history, the fault lines of conflict were religious—Catholic, Protestant and Jewish. The theological differences between these three religious groups defined how each focused on the major cultural issues of the day (e.g. Prohibition of the 1920s, public education and its curricula in the 19th century). Protestantism dominated the culture and rather routinely set the culture’s agenda. America was a Protestant nation and that fact defined almost every cultural issue of the 17th, 18th and 19th centuries. But in the 20th century, that consensus began to shatter. The Gaza Strip, nestled between Israel and Egypt, is a mess. Recent events have demonstrated the intractable nature of this small strip of land. The Palestinians who live there are in poverty, with high unemployment and constant shortages of food, power and almost everything else. A snaking metal fence that divides the Gaza Strip from Israel has become the focal point of a conflict that stretches back to 1948. In May over 60 Palestinians were killed by Israeli Defense Forces and hundreds more were wounded. Hamas, which rules Gaza, has been organizing a “March of Return” to reclaim the land lost in 1948. I was recently reviewing some old articles I had stored and found, in the 13 November 2006 issue of Time magazine, a debate between Richard Dawkins, an avowed atheist, and Francis Collins, a Christian who converted from atheism. It is an insightful debate, well worth reading. Dawkins is an Emeritus Fellow of New College at Oxford University in England. His 2006 book, The God Delusion, attacks faith philosophically and historically, using the Darwinian hypothesis for its intellectual support. Collins is Director of the National Institutes of Health. At age 27, he converted from atheism to Christianity. His book, The Language of God: A Scientist Presents Evidence for Belief, was a bestseller. 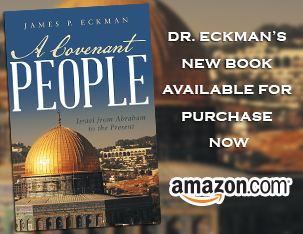 Dr Eckman begins a new study of the book of Acts. Written by Luke, Acts concerns the very vital period in Christian history between the resurrection of Jesus and the death of the apostle Paul; a time when Christian ideas and beliefs were being formulated and when the organization of the church into a worldwide movement was being developed. It has been said that the one thing we learn from history is that we learn nothing from history. Sadly, this is often true. We are to learn from history, but tragically rarely do we do that. But, there is something called a philosophy of history and genuine, biblical Christianity has something to contribute here. This is an important issue because we in the Postmodern world are slaves to what is often called “presentism,” which in itself is a philosophy of history. Presentism is an arrogant way to view the past. It assumes that our assumptions, our technological achievements make us superior to every previous generation and age. The Pew Research Center and the Gallup Organization recently released separate reports concerning the state of religious beliefs in the United States. Both evidence an absence of certainty when it comes to major doctrinal issues, and point to one of the major themes of the Pastoral Epistles (1 and 2 Timothy and Titus), namely that sound doctrine produces godly living. There is a consequence when sound doctrine is not evident in religious belief systems. For example, nine-in-ten Americans believe in a higher power, the Pew Research Center shows, but only a slim majority believes in God as described in the Bible.